Our Skinny Chef with Menu-Board is very popular for pubs and restaurants to publicise specials and draw attention to their menus. This is one of those models with one of those faces! ..you'll always find someone who knows someone that he reminds them of! 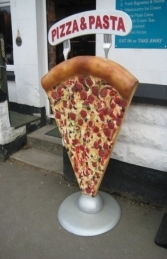 The Skinny Chef is a great character; he is a dramatic & attention grabbing way to make YOUR shop, pub, restaurant or café stand out from the competition. NB - DELIVERY - Please note that the delivery price quoted through the website ordering system is based on average delivery costs when the ordered item is sent via a pallet-line service. Wherever possible we try to personally deliver large items to your door when we can combine deliveries in an area; this does require flexibility for delivery date. Delivery charges on orders for multiple items will of course be discounted accordingly.